Portable message signs are being brought in at major roadworks on the A3 in Surrey, with drivers advised not to divert around country lanes. The signs have been installed at the A3 Hindhead scheme which includes building tunnels under the Devil's Punchbowl. The Highways Agency said they would give better information and help people make informed decisions about journeys. Project manager Paul Arnold said data showed people were "better advised to stay on the A3 rather than divert". The signs have been installed at Thursley and Liphook, near the Hindhead roadworks and the A3/A287 crossroads. The A3 Hindhead improvement scheme is to complete the dual carriageway link between London and Portsmouth and remove congestion, particularly at the A3/A287 junction. 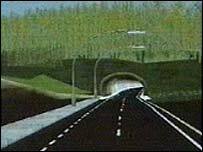 It includes a £371m project to build tunnels under the Devil's Punchbowl Site of Special Scientific Interest, which will take four miles of the A3 beneath the sandy heathland hollow.